Dealers are building on the success of auto-steer to show customers the value of keeping implements in line with tractors. Many farm equipment dealers with precision farming interests consider auto-steer to be the entry point for customers who want to utilize technology. In many cases, those systems are now standard features on new tractors rolling off the assembly line. The tangible benefits of auto-steer are easily proven through reduced operator fatigue and the ability to maintain a straight path though the fields. Now dealers are using this philosophy as the cornerstone to successfully sell implement guidance systems and show customers that precision accuracy can extend beyond the tractor. Implement steering adoption isn’t nearly as widespread as auto-steering systems on tractors. But farmers interested in implement guidance tend to already be invested in precision technology, Rohlik notes. Sugar beet farmers have proven to be a particularly good customer base for implement steering since Haug Implement, a John Deere dealership, began selling the technology about two years ago. It has sold Orthman Shadow Trackers — a single cylinder and blade module that mounts to the implement toolbar — and the MBW ProTrakker hydraulic hitch. • Offer video tutorials or ride-and-drive field days to give customers a hands-on experience with implement steering technology. 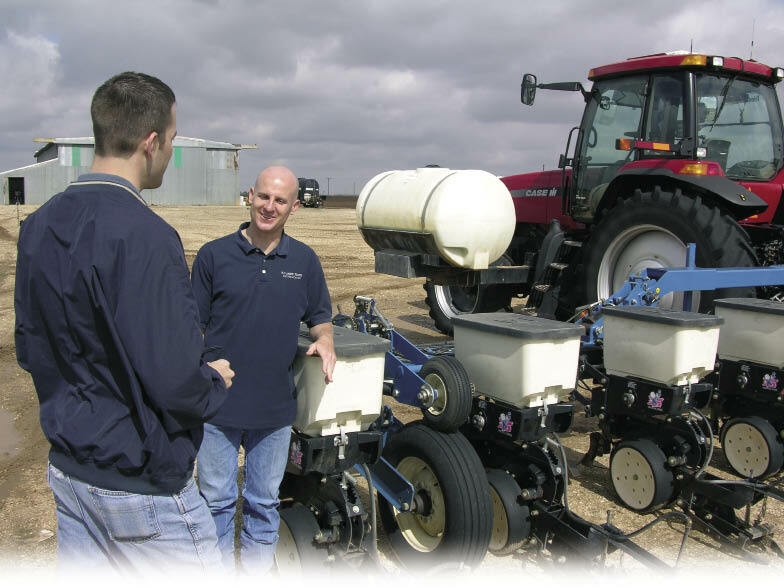 • Develop a checklist to evaluate a farmer’s need for implement steering, then explain the value to the customer. • Start small and work with a handful of customers to make sure implement steering products work properly to avoid overselling something you can’t support. Both are active systems, meaning they guide the implement independent of the tractor. Haug has also sold passive systems — which only require separate GPS receivers on the tractor and implement. Haug sold 10 implement guidance systems to beet growers last year and other dealers are having similar success with this customer base. Kibble Equipment in Redwood Falls, Minn., sold seven active implement steering systems last year and John Beadell, integrated solutions manager with the John Deere dealership, says he expects to double that number in 2013. An important step was making sure the dealership didn’t bite off more than it could chew when initially selling implement steering products. The first year Kibble Equipment sold MBW hitches, Beadell says he modestly marketed the product to customers, because he didn’t want to sell something he couldn’t properly support. “We wanted to make sure we were going to get the results we desired and we didn’t dive in whole-hog,” he says. “We only contacted a couple growers who we knew would be interested because they are making multiple passes in the field. The cautious approach is allowing Kibble Equipment to branch out this year and market implement steering products more aggressively to beet growers, organic farmers and strip-till farmers. While interest in implement guidance is rising, dealers say a key to selling the technology is giving customers a hands-on experience and thoroughly explaining the benefits. This is especially critical because of the cost involved. Active implement guidance systems can cost upward of $10,000. Haug Implement hosted field days the last two years where customers can get behind the wheel of a tractor connected to a planter, strip-till unit, sprayer or beet defoliator, with an implement steering system. The dealership also held a technology clinic where it showed video demonstrations of technicians setting up an implement steering system on a beet defoliator and then let customers try out the systems. John Isaacson, salesperson at Isaacson Implement in Nerstrand, Minn., talks about his approach to selling implement steering technology and the increasing interest in the technology, especially among strip-tillers. Hand-in-hand with demonstrations is customer training. Dealers are making sure farmers understand implement steering capabilities, which can help close a sale. This is especially important for new customers, notes Jason Pennycook, precision farming specialist with Johnson Tractor, a Case IH dealership in Janesville, Wis.
Johnson Tractor has been selling Trimble’s TrueGuide passive implement steering system for the last 5 years. Pennycook says sales started slowly, but as he’s been able to educate and train customers on the benefits, interest has picked up and the dealership consistently sells 3-5 systems per year. Dealers say it’s important to have a thorough understanding of a customer’s farm to pinpoint the value they’ll get from an implement steering system. Rohlik will often go through a 5-step evaluation of a customer’s operation to assess their need. This includes looking at what type of GPS system the customers has, what their field conditions are, do they have an integrated auto-steer system on the tractor, how much implement drift are they having and is their equipment properly calibrated. After a customer has an understanding of how implement steering can improve their efficiency, dealers drive home the sale with an explanation of financial savings. While every situation is different, Beadell will draw from university studies on the benefits implement steering can have in allowing farmers to save input costs and improve yields. For Rohlik, it’s a matter of conveying to the customer that improved accuracy will produce increased revenue through improved yields. Sometimes the payback is less tangible, though no less valuable. In Wisconsin and northern Illinois, Pennycook has customers with curvy fields wrapped around waterways. After planting in the spring with implement guidance, customers are able to harvest in the fall knowing that the rows are straight. Although dealers are having success selling implement steering, they acknowledge that there is some room for growth. As implements grow larger, the need to accurately steer those will become essential. “One of our main focuses is going to be on marrying those power planters with tractors, and implement guidance is the best way to do that,” Beadell says. Another focus for Kibble Equipment is going to be on implement steering for application equipment. Beadell says potential government regulation of certain types of fertilizer could open the door for more sales of implement steering systems. So how do dealers plan to expand their reach with implement steering products? Pennycook says Johnson Tractor targets operations of about 1,000 acres or more, primarily corn and soybean growers. Passive implement guidance systems generally cost about $3,500 with Wide Area Augmentation System (WAAS) guidance and up to $7,500 with RTK, so it can be a more affordable option than active systems. Much like auto-steer on tractors, Beadell says it will take time for farmers to embrace the benefits. But once they do, the market could explode.